Writing is essential to learning. One cannot be educated and yet unable to communicate one's ideas in written form. But, learning to write can occur only through a process of cultivation requiring intellectual discipline. 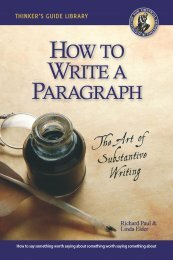 As with any set of complex skills, there are fundamentals of writing that must be internalized and then applied using one's thinking. This guide focuses on the most important of those fundamentals. Skilled writers do not write blindly, but purposely. They have an agenda, goal, or objective. Their purpose, together with the nature of what they are writing (and their situation), determines how they write. They write in different ways in different situations for different purposes. There is also a nearly universal purpose for writing, and that is to say something worth saying about something worth saying something about. In general, then, when we write, we translate inner meanings into public words. We put our ideas and experiences into written form. Accurately translating intended meanings into written words is an analytic, evaluative, and creative set of acts. Unfortunately, few people are skilled in this work of translation. Few are able to select and combine words that, so combined, convey an intended meaning to an audience of readers. At present students are poor writers, not because they are incapable of learning to write well, but because they have never been taught the foundations of substantive writing. They lack intellectual discipline as well as strategies for improving their writing. This is true on the one hand because teachers often lack a clear theory of the relationship between writing and learning and, on the other, are concerned with the time involved in grading written work. This guide provides techniques that enhance student learning and foster the ability to communicate clearly and logically what one is learning. The development of writing abilities, as well as all other intellectual abilities, occurs only through sound theory and routine practice. When students understand the relationship between learning and writing, and are engaged in routine writing practice using the tools of critical thinking, they are able to learn content at deeper and deeper levels, and gradually improve their ability to communicate important ideas.